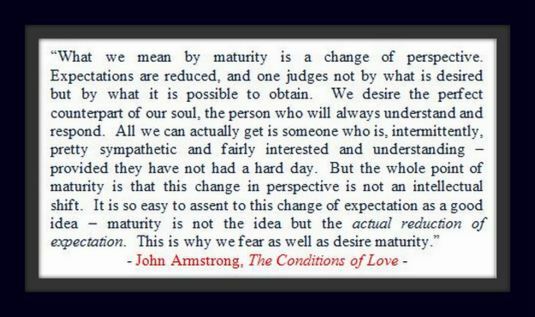 This concept of “maturity” as I encountered it in John Armstrong’s Conditions of Love is caught like a burl in my system. Maturity as “not the idea, but the actual reduction of expectation.” Maturity is reductive. Is that so? Is the process of human living a progress of delimitation, scoping the range of experience to our actual organismic potentials? 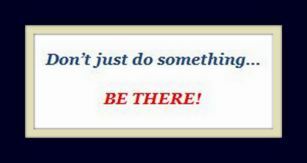 Process, progress, growth not expansive, extending operations, but boundarying and restraining limitations to our hopes? Whenever I “get” something like that, I noticed I want to take off with it. Like a skipping stone, I feel inspired and start leaping the surface of things – making connections with this concept and that image, this thinker and that artist, that idea and this experience… activating PATTERNS from my past and projecting POSSIBILITIES toward the future… LEAVING THE PRESENT. My helpmeet described this as an interesting and fascinating capacity of brains excited by the ineffable to apply TOP-DOWN (or metacognitive, reflective, intentional attention, interpretive) strategies to BOTTOM-UP (automatic, subconscious, pattern-oriented, limbic or reactionary, survival-based) strategies in order to, in a way, burl them – mesh them – unite them with WHAT IS – the Umwelt – our actual EXPERIENCE of BEING a living organism PRESENTLY. We NEED both strategies to survive, and thrive. Much of our life-world is uncertain and unknown to us – much we will never KNOW in any sense like “understand” or “comprehend.” Life constantly HAPPENS. We are quite limited, reduced, in our capacity to TAKE-IN, ABSORB, “com-prehend” (apprehend-with) all that our life-bubbles afford us and confront us with each moment… We NEED the emotive, reactive, pattern-based knee-jerk reactions to navigate much that could be life threatening (thought not much IS these days – WHAT IF something IS? )…no time to reflect or discourse or meta-cognize it if a car or snake or fire is about to strike you… but we also NEED the reflective, metacognitive capacities to distinguish between what is ACTUALLY life-threatening and what is ONGOING EXPERIENCE – opportunity – potential to comprehend, learn, understand, adapt, adjust, in-corporate, BE WITH. I was watching my dog as I read this, and it is clear that he is more mature than I by these measurements. For me, maturity is the increasing realization that whenever there is a problem, I am the cause, but not only realization but living accordingly in a peaceful manner. interesting 🙂 Thanks for sharing. Yes, perhaps (re: your dog). When I struggle over these things with my therapist, he often just smiles bemusedly at how and what sorts of animals we are – figures these things are for us, like the particular kind of hover and flight is for a hummingbird. Our unique ways of being beings. i like that “safety is a veneer.” Thanks for sharing!